An easy read for young readers the storyline is simple but still packed with adventures. My only complaint its almost over packed with girly fluff (even the ponies have wings) but it promises to delight all the little girlie girls out there that cannot get enough of sparkles, butterflies, ponies and of course fairies. Due to be released in April this year! 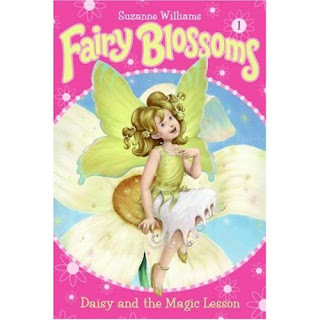 I have one advanced reader copy of Fairy Blossoms #1 available to give away to one reader! This contest will end March 5nd at midnight! I'd like to read Ten Naughty Little Monkeys, looks very cute. We have her book My Dog Never Says Please, it's great. My little princess is 2 1/2 years old. Her books look like a lot of fun. I would like to read My Dog Never Says Please to my 20 month old princess. MY SWEETIES ARE 5 AND 6 AND THEY WOULD LOVE ALL THESE BOOKS. I THINK THE FAVORITE WOULD BE 10 NAUGHTY MONKIES, THOUGH. 5 LITTLE MONKEYS JUMPING ON THE BED IS THEIR FAVORITE SONG! Library Lil looks great. My little princess is 3. I would read My Dog Never Says Please to the 4 year old Princess that I watch. Mommy DOesn't Know my Name sounds like a good one! Haha! I think I would love to read "The Stubbornly Secretive Servant" because I want to find out why Jonathon never showed up! My little adopted sister is 8, and I think she would love these books. I have added you to my blogroll! I subscribed to your blog, because I love it! My little princess is my granddaughter age 7; she is an avid reader and loves all things "Princess" so I would begin the Princess series of books with her beginning with "Princess Power: #1 The Perfectly Proper Prince"
The ten naughty little monkeys looks like a great read. my little princess is 23 mos. old. Thanks for the awesome giveaway! Thanks for the wonderful giveaway. I'd love to read to my kids The 10 Naughty Monkies. This book sounds adorable. Thanks again. My five year-old princess would love the Princess Power books. I think my daughter would have som much fun with Old MacDonald in the City. We love singing the classic, so this would be a fun twist! She's 2 going on 10! MY DOG NEVER SAYS PLEASE. She's 3. I think I could relate well to "Mommy Doesn't Even Know My Name"! I am forever calling my sons (and students!) by the others' name! Although I don't have a princess of my own, I'd love to have this for my classroom, where I teach about 8 princess who range from 6-8! Ten naughty monkeys I think my 4 yr old would love best! Thanks! My little princess is 4. She would love this book, and also Mommy Doesn't Know My Name. I have the same habit as the mom in the book! library lil looks great.my 2 princesses are 7 and ao and love the library. My little princess just turned 5, and she would love to read Library Lil. I think she loves the children's librarian more than her mother! I love the title of My mommie doesn't know my name. With 6 kids I totally agree! I would like to read Library Lil. My princess is almost 3! I would like to read Library Lil. My little princess is 9. We own My dog Never Says Please, cute book. Mama doesn't know my name....my princess is 4 1/2. I picked this one because, as the youngest of 7, I was called, Shaw-Kar-Carm-Bri-Steph-Lind-Julie! My Princesses are 4,6 and 8, they'd love the Princess book. My oldest reads her fairy books to the younger ones on the weekends. I'd like to read "mommy doesn't know my name " to my almost 6 years old daughter, I'm sure she would love it ! Mommy doesnt know my name - three!! I have a little boy but my BF has 3 little girls 3, 2, and 9 months! I'd like to read Here's Hillary and my princess is 6 ! I think my girls would love My Dog Never Says Please. My oldest checked out one called Dog's Breath and we had to read that one over and over because they thought it was so funny. My girls are 3 & 7. Thank you! "My Dog Never Says Please". I'd love to read the 'Princess Power' series and my little princess turns six on Sat. March 8..ohhh how the time flies..
My Dog Never Says Please looks cute. The princesses in my life are 2 1/2 and 1. I would like to read The Witch Casts a Spell. My little princess is 3 1/2. I would like to read "My Dog Never Says Please". My little princess just turned 5. Ten Naughty Little Monkeys looks cute and my princess turns 7 on the 13th of this month! I'd like to read Ten Naughty Little Monkeys, looks very cute. My dog never says please. They are 8 and 2-my precious granddaughters. I would like to read Old MacDonald in the City the most. I don't have a little princess of my own.